The canvass is in: it seems the majority is ready to shut the door on pumpkin recipes for the rest of the season. 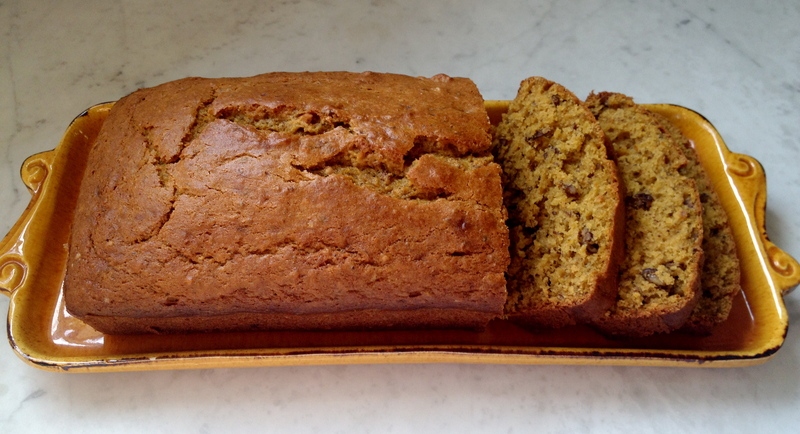 There was one more can of organic pumpkin puree in my cupboard, and with pumpkin pie so overly ubiquitous each November, I headed straight for the loaf pan. 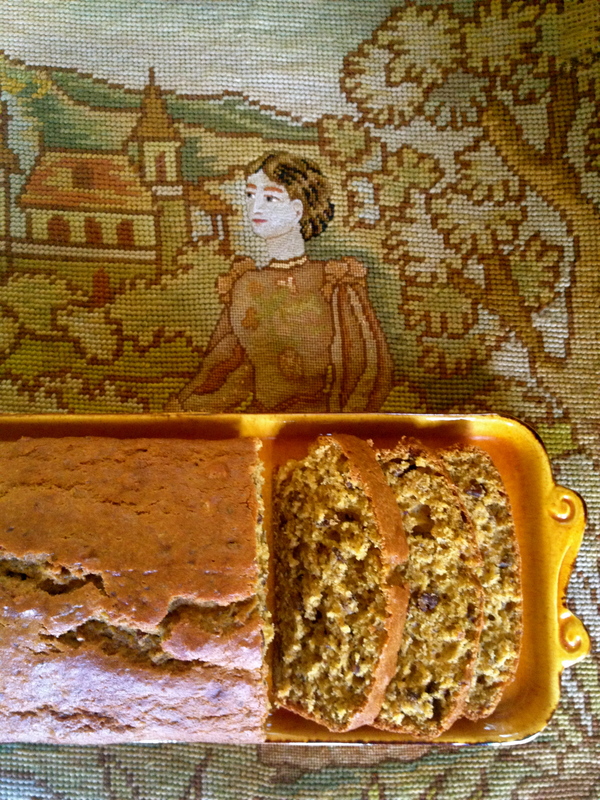 I am a self-professed autumn flavor enthusiast, and I myself could bake pumpkin bread all year round. Unfortunately, others lose patience with pumpkin by the time Thanksgiving rolls around. So here is the last hoorah, the final shebang. 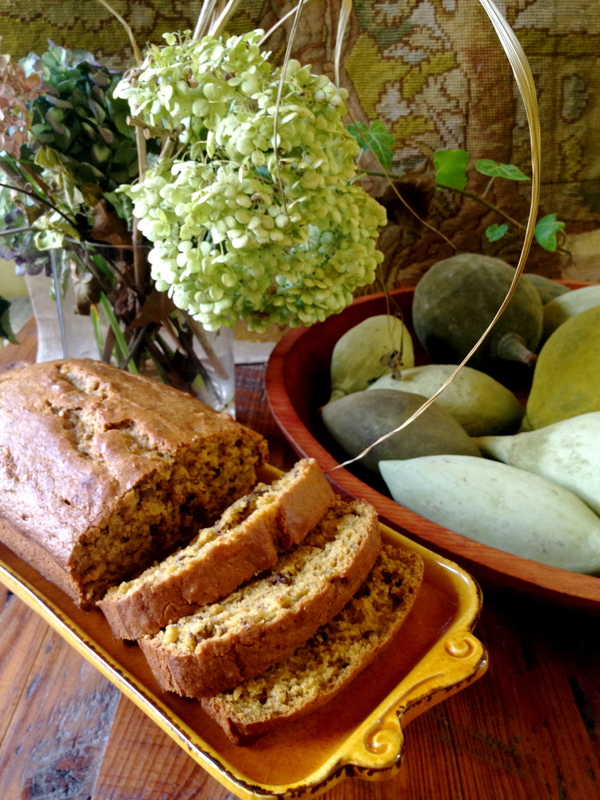 This bread is a satisfying mid-morning snack with a hint of warm crunch from the pecans. It is moist and spicy without being too soft and insubstantial. Pair it with a cappuccino on Saturday morning and relish in the fall’s final pumpkin treat. Recipe: Preheat oven to 350 degrees F. Grease a 9×5 loaf pan. In a medium bowl, whisk together the flours, flaxseed meal, baking powder, salt, cinnamon, baking soda, nutmeg, and ginger. In a large bowl, beat the eggs lightly with a fork. Add the cooled melted butter (don’t add hot butter or you will scramble your eggs). Also add the pumpkin, sugars, and vanilla. Stir to combine. Add a little bit of water to ensure the mixture is moist (just enough to keep it moist, not too much to make it watery). Add the dry ingredients into the wet ingredients in third, mixing to combine. Add the pecans, mix to evenly distribute, and pour the batter into the loaf pan. Bake for 55-60 minutes, or until a toothpick comes out clean. Cool in the pan for 15 minutes before inverting and cooling completely on a wire rack.